Dr Jamie Steer ponders whether the ‘deer are like moa’ debate has passed its use-by date. This is the second and concluding part of the series – read part one here. I reckon that critics of the ‘deer are like moa’ position often misinterpret it. Deer advocates have never claimed that deer are the same as moa in terms of what, where and how they eat, but simply suggest that deer are functionally equivalent to moa, as large forest-dwelling herbivores. This means that they perform similar overarching roles or occupy similar niches within the forest – not that their effects are identical. And, while these critics acknowledge the importance of moa browsing in pre-human ecosystems, they also still often make the ‘straw man’ argument that enclosure plot experiments prove that browsing damages forests. Observing this, hunters refer to the plots as ‘exclosures,’ pointing out that they only show what forests are like without large herbivores, not what they were like in pre-human times. Ironically, by fixating on the many differences between deer and moa, mainstream conservationists risk undermining their own forest restoration efforts, for these too cannot replicate the ecosystems shaped by moa and other extinct native species. There is simply no way to bring back the functional roles of extinct species such as the adzebill, Haast’s eagle and New Zealand raven. They also seem to undermine the fond comparisons that are frequently made between the functional roles of many other native birds (or other native animals) and the functional roles of mammals elsewhere in the world. For example, weta are claimed to have functional similarities to small mammals such as mice in other parts of the world, particularly as seed dispersers. Are these comparisons any more valid than those between moa and deer? Hardly. Hunters, on the other hand, undermine their position with the ‘deer are like moa’ argument because it buys into the same flawed assumption that their opponents make: that the most desirable kind of ‘natural’ ecosystem to strive for today is a pre-human one. But arguing that deer should be accepted simply because they replicate the ecological effects of extinct moa pretty much endorses the same ‘cuckoo’ perspective. In many ways, the concept of functional equivalence (‘deer are like moa’) itself is comically anachronistic. It sets up the image of a tidy, orderly little world in which every species plays its part in ensuring the clockwork-like stability and replicability of ecosystems. Every species has its role or place where it belongs. But what the science of the past 40 or so years has consistently shown is that nature is more about flux and indeterminacy. Little is predictable or inevitable about the trajectory of ecosystems or the roles of their component species. The functions we have bestowed on different species and the importance we have placed on those functions are mostly just made up to fit the stories about nature we currently want to believe. 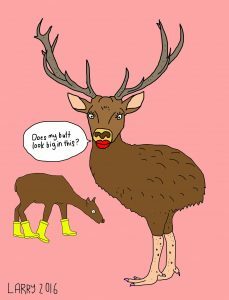 For me, trying to dress deer up as moa-in-drag is unnecessary and even unhelpful, as it reinforces the idea that we ought to force nature back to some idealised but unattainable former state. Deer do show some functional similarities to moa, but there are important differences too. They probably do change forest composition in some novel ways. But in the year 2017 – centuries after the extinction of the moa – the species mix has been utterly and irrevocably transformed from the pre-human state (with many more changes still to come). So aren’t the moa comparisons all a bit irrelevant now? Deer are widely valued elements of New Zealand’s contemporary biodiversity (remember, ‘biodiversity’ means more than just indigenous biodiversity). A Landcare Research survey of public views towards introduced wildlife in 2001 showed that the overwhelming majority of New Zealanders enjoy seeing deer in the wild. Rather than attempt convoluted and potentially counterproductive ecological justifications, why can’t hunters just say that they like and support the presence of deer in New Zealand, and that there’s actually nothing wrong with that? We’ve been debating whether deer are sort of like moa for close to a century, with no conclusive result. That’s because it was always a distraction from what was really at issue. The fact is that deer are here, we like them, and they have a place in post-moa New Zealand just as we do. They’re not substitutes for anything and they don’t need to be. This post is adapted from an article originally published in New Zealand Hunting & Wildlife, the quarterly magazine of the New Zealand Deerstalkers’ Association Inc. 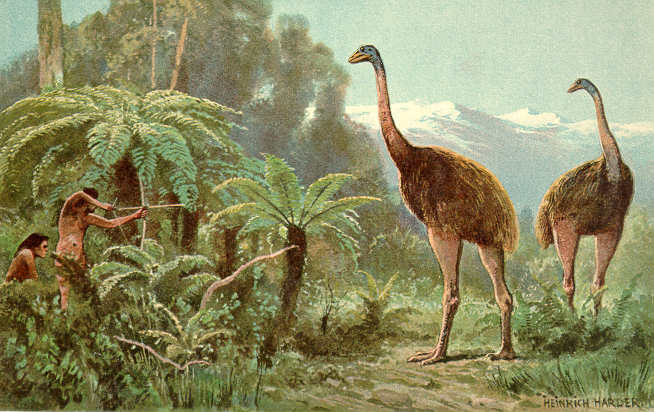 Featured image: Early depiction of Maori hunting moa (erroneously pictured with bow and arrow). See Creative Commons. Thank you Jamie, your arguments are very refreshing. It is time that conservation in New Zealand had a reboot and you have much to offer. That has to be the worst image of moa ever made – it is wrong in every way. The erect stance is impossible for moa, the bare-legged look is like an ostrich and they were nothing like this, even the large eyes are wrong. Guess this all goes with the (acknowledged) fabrication of giving Maori bow and arrows. I am glad the author says moa acted nothing like deer. Moa likely never exceeded 2 birds per km and selectively browsed shrubs/. trees. They lacked the specialised ruminant system that allows deer to eat low value browse and so exist in high densities leading to the complete demolition of the understorey that we observe where they reign unchecked.. Seriously though Trevor, what do you make of my contention that the morphological/ecological differences between deer and moa has been something of a distraction? Can we only accept introduced wildlife if they are either totally benign, or accurately replicate the effects of extinct natives? Regards the latter comment – yes and know. As you say, folk should not, and cannot legitimately say that deer and the mammalian browsers are replacing moa – that is patently incorrect and long refuted. So it is more about what the aim is today. We have to accept that the flora developed/evolved in the absence of ruminant browsers, and without browsers with teeth etc – and this is why unchecked populations of goats or deer have such huge effects on the flora, leading to complete exclusion of multiple species – ie changed species composition and likely extinction of some taxa in the longer term. The question should be do we want to preserve the NZ flora with a composition and diversity that typify NZ – or do we want to loose that and accept only certain elements will survive. That would be the case if we allowed ungulates to be unchecked in density and we know they will reach large numbers given they have no biological controls in NZ such as wolves etc. Moreover – hunters, hunting only for fun have no demonstrated ability to keep the populations of ungulates in sufficiently low density that long term denigration of the environment wont occur. The immediate impact (ie in 1-10 yrs) can be complete removal of the understorey, but more serious is the impact that will occur over hundreds of years because of the delay effects of seed banks and life cycles of plants. So in human terms it will take a while, but in geological terms it is rapid and presumably irrevocable change in the species composition in NZ. And why – so a few folk can shoot a deer. It might be nice to shoot deer – but they live naturally in say the USA so one can go there to shoot one – they have in places quota systems so you have to wait one’s turn to get a go as it were. Should we let cougars go in NZ so folk can hunt them, after all they would do well eating teh deer and goats. That would be quite satisfying to some – but it would be another selfish gratification not in the best interest of most NZers. There are innumerable translocations of deer and other introduced animals to and in NZ – we certainly do not need more and many that did occur should be seen for what they are – major mistakes. Thanks a lot for this very considered response Trevor. I owe you one in return. My response is that it is not just the native species that typify the NZ flora. We have over 26,000 introduced plant species. Many of these species are widespread and highly valued. Our ecosystems are nearly all comprised of a mix of native and introduced. I believe that we need to do better at appreciating the diversity of our flora, including their varied origins. Further, it is not a stark choice between purity or obliteration. We can maintain most of our more vulnerable native species and ecosystems in much smaller ranges than they once inhabited. But, yes, not all of them. There has to be a little bit of give here though. Proclaiming that we are going to endeavor to save everything, everywhere just doesn’t ring true anymore. It’s good politics but bad management. Ecological change will happen by default either way, but I’d rather we were open and strategic about it. My response is that retaining deer is not just to the benefit of hunters. As I noted in the article, most NZers enjoy seeing deer in the wild too. It is also not just about us and what we want. Deer in NZ value their own lives as well. I think you are a little unfair to hunters. Cosmically, it is a fairly trivial thing to hunt a deer, but then so too is bird watching or botanizing (I suppose I could add bone-collecting to that list as well?). My response is that there are innumerable other experiences or forms of recreation that could be limited to their place of origin using this argument. Personally, I don’t think we need to be that harsh. On a practical level, not everyone in NZ can afford to jet set around the world to their favourite game parks either. I’m also like most other people in NZ – I quite like seeing deer in the wild. I don’t run a filter over everything I see and judge it on where it came from (or rather where it was brought from in this case). We need to be questioning the assumption that things have a natural place in the world where they belong now. My response is that I agree that we should think carefully before pursing any further deliberate introductions. I’m not advocating for that. But we also can’t use our past mistakes as justification for treating the species we have introduced as valueless or unworthy of consideration and compassion. And, yes, that extends beyond merely deciding on the most humane ways of killing them. Our responsibilities are not just to native species. Most of our conservation practice in NZ is directed toward protecting a small and charismatic sub-set of our native biota, principally birds. These are also the species that tend to lend the most to our economy (particularly tourism) and existing sense of national identity. There will come a point where we will have to own up to the fact that there is more than a little ‘selfish gratification’ in those decisions. “Proclaiming that we are going to endeavor to save everything, everywhere…”. This is exactly the absurd kind argument that Bill Benfield uses in his blogs and books. Please provide evidence that this view has been proclaimed anywhere. Secondly, the fact that “most” NZers like to see deer does not mean that most NZers want them eating everything, yes, literally everything within reach, in our native forests. What you describe in this context is nothing more than an emotional response to seeing a large animal in the wild. Thirdly, your focus on deer as a representative of increased biodiversity is, as Trevor Worthy makes abundantly clear, a fallacious argument as this group of browsers alone reduce biodiversity and have the capability of making it permanent. The same is true for pretty much all invasive species (note that I do not use the word “pests”) which, in the NZ context, cannot be discussed one species at a time. They exist in communities that compete for precious resources that our native taonga are absolutely reliant on. Why don’t you go and tell “most New Zealanders” that and ask what they think? Thanks for your thoughts Duncan. Here are my responses. Response: One place to look would be the NZ Biodiversity Strategy. Goal three of the Strategy in part is to ‘Maintain and restore viable populations of all indigenous species and subspecies across their natural range and maintain their genetic diversity’. While reasonable enough in theory, the practicality of it is dubious. Most of our biodiversity is invertebrates (95% of species), the majority of which are yet to even be classified (much less managed for conservation). Many of these species have extremely localized populations. Maintaining all these native species, sub-species, and their genes, and across their natural range, in reality leaves very little, if any, room for humans or the species they have introduced. It’s neither realistic nor desirable. Another place to look would be the Government’s recent endorsement of the Predator Free NZ vision. This vision is not about setting some places aside where certain mammals may be controlled or eradicated, it’s fundamentally about eradicating them everywhere. It’s an extreme vision with no scope for compromise. And, like all absolutes, it’s very intoxicating for a segment of society. Response: Deer do not eat everything in the forest within reach. Their effects are variable and depend on the current species composition in the understorey. Deer are not present in all our forests either. Yes, species that are more palatable to deer will likely become less numerous in the canopy over time. They will be replaced by other species that are less palatable. Deer are one of thousands of introduced species that are gradually changing our ecosystems over time. In my mind it is not to a better or worse state in general, but merely to a different state. Response: No, deer are by no means the only browsers that have the capacity to change the structure and composition of our ecosystems. Other familiar examples include possums and goats. The attitude that our ecosystems should be identified and valued simply by their native components (i.e., excluding introduced species) is in my mind deeply flawed and retrospective. As you note, it is not always helpful to discuss ecosystems one species at a time and introduced species, in general, have increased the species richness in this country – quite dramatically in fact. New Zealanders current attitudes to biodiversity are a reflection of the sharply dichotomized environmental education (e.g., native or introduced, modified or pristine, nature or culture) they have been imparted for the last 40-50 years. For perspective, we will recall that colonial New Zealanders in the mid-19th century were often similarly black-and-white with their understandings of nature. They generally preferred the introduced component and considered the native component to be an encumbrance. We can see now that that was a mistake but are probably not quite yet in a place to fully reflect on the ways that our present understandings are similarly misguided, not to mention unfair. What is most splendid about this weblog series is how you have stripped the arguments back to their fundamental elements – so very revealing. I have been struggling with the contradictions in these arguments from both sides of the debate myself but you provide a simple clarity about them – thanks. And, as is so often the case when the arguments are stripped back to their fundamentals, you’ve demonstrated along the way that rather than a consensus up the middle there is a better conceptual pathway that detours around all the unnecessary, distracting complexities – nicely done. This doesn’t, however, relieve us from the other and more substantial complexity of the problem which is the human dimensions of the topic – politics and power. Whose values does biodiversity management most represent? Is it possible that the different and diverse values about native and exotic wildlife can coexist to inform pluralistic biodiversity strategies and policy? Currently, in New Zealand we seem a long way in this debate from mutual respect of different values and arguments. Nativism, in particular, and its perspectives about alien or invasive species appears to be particularly intolerant of other perspectives and values, perhaps because of its puritanical foundations. Thanks a lot Wayne – I agree with you. Here’s a cursory attempt at answering your two questions. Whose values does biodiversity management most represent? I think that biodiversity management at present in New Zealand is mostly concerned with maintaining the values we have for the indigenous components of our biodiversity – birds in particular. These values are held especially dear to middle to upper socioeconomic, university-educated, urban pakeha (a demographic that includes myself and almost all the contributors to Sciblogs). And the general public’s understandings of which species to value (and how much or how little) have been heavily, and in my view, disproportionately influenced by natural scientists such as conservation and invasion biologists – almost exclusively from the above demographic. These sciences are framed around our values for nature, and conservation is framed alongside as a fairly altruistic contribution to realizing those values. We’re just doing what’s right, right? In theory it is, but I think in practice the stuff we save is the stuff that’s most useful to us. In general, the primary determinant of any species’ perceived value in NZ is the extent to which that species contributes to our sense of identity and/or our economy. Putting it bluntly, we value the species we can get the most out of. I think that’s one reason why no one thinks we’re quite as great as we do. Is it possible that the different and diverse values about native and exotic wildlife can coexist to inform pluralistic biodiversity strategies and policy? For me, the short answer is yes. There have been many attempts at this over the years, and we have made progress. Legislative exceptions for game species are one notable example. But I think we need to go much further than that now. As mentioned above, it shouldn’t be all about us and what we want either. We also need to incorporate the values that both native and introduced species have for their own lives. At present I think we’re far too dogmatic, deciding that this species is valuable and so the more we can make of it the better, and that species is not valuable, so the more we can get rid of it the better. This mentality means that we probably expend far too much time and resources trying to kill or prevent the spread of invasive species over vast areas and far too little thinking about the assumptions that underpin those decisions, and the circumstances in which those species could be accommodated. In short, we’re reluctant to think too deeply about why we do what we do. We’ve become very comfortable with the value assumptions we made several decades ago (eg, human-induced extinction is always intolerable, we can restore ecosystems, species have a place in the world where they belong). I think a lot of intellectual water has passed under the bridge since that time and we need to go back to first principles with some of this stuff. I think the European blackbird is beautiful. I have seen deer in beech forest and gotten a thrill. But I would rather they were gone from this country. Not because of some small-minded, Trumpian, nationalist feeling, but because I want as rich and diverse world as we can possibly preserve. Now if you’ll excuse me I can hear a bellbird outside – far too rare a thing where I live! Pardon me if I don’t get quite the same thrill from the house sparrows. Great, thanks for your comments Joe. Here are my responses. Those who value natives of introduced species don’t do it for no reason. New Zealand’s flora and fauna are distinctive, beautiful and interesting – as, I’m sure, are the indigenous flora and fauna of every place. The pleasure and interest and (for some, including Maori) spiritual value that is drawn from our particlar flora and fauna motivates us to protect and nurture it – no-one else is going to. I agree that our biodiversity is distinctive and interesting, but I don’t agree that this is just due to our native species. I think introduced species add enormously to the character and sense of place in our landscape. Remember that diversity is not just about species either; it’s also about ecosystems. Our ecosystems are almost entirely hybrids of native and introduced now. You won’t find any New Zealand ecosystem anywhere else in the world. If we were to take your advice and value the introduced species as much as the indigenous species; if we were to let things “play out”, and if other nations in the world did the same, we would be releasing the handbrake on our way to global homogeneity and massive loss of diversity. If you don’t think diversity is valuable then I don’t know what to say. I haven’t said that we should value introduced species the same as native species. The weighting (if we must use one) is totally up to the individual. The fact is that species introductions have dramatically increased species richness in New Zealand. Whether that is a good thing or not is again a matter of conjecture. The paper you refer to points to extinction rates in recent times being higher than they have been in the fossil record (the so-called background rate of extinction). I agree that this is nothing to celebrate. But it is important to remember that this is only part of the story as well. Rates of evolution are probably higher than they have been at many times in the past too. Check out Chris Thomas’ take on that, also in Nature. Our biodiversity is changing in response to the enormous changes we have forced upon it. Once again, it’s a matter for debate, but I think a lot of those changes are now necessary, and they may well be better for our ecosystems in the long-term. The idea that human society could expand and influence the environment in so many ways, but that our wildlife could remain static, or even relatively static, strikes me as very unrealistic. I think the European blackbird is beautiful. I have seen deer in beech forest and gotten a thrill. But I would rather they were gone from this country. Not because of some small-minded, Trumpian, nationalist feeling, but because I want as rich and diverse world as we can possibly preserve. Now if you’ll excuse me I can hear a bellbird outside – far too rare a thing where I live! Pardon me if I don’t get quite the same thrill from the house sparrows. Most NZ conservationists would probably disagree with you about blackbirds. We tend to focus our control and eradication efforts only on the small proportion of species that are considered ‘invasive’ – and blackbirds are not one of them. Sorry to disappoint you but no one is suggesting we get rid of them because they are European. I reckon we need to think more carefully about what thoughts like that reflect about ourselves and our own ‘place’ in the world. Again, I’m not saying that you need to consider introduced species with the same sense of awe and reverence you obviously have for natives. You might be quite justified in getting a special thrill out of a bellbird. Most New Zealanders enjoy seeing and listening to introduced birds though. They think that they contribute to our environment and sense of connection with nature. They add to the richness and diversity of our local ecosystems. I think we would do well to build on these sorts of everyday experiences to develop are more balanced perspective on the roles and values of the varied species in our ecosystems, and that includes an appreciation of their varied origins. Ok. Some specific points and then an overarching one. Evolution may well be accelerating. However, unless it is causing enough speciation to compensate for the increased rate of extinction then we have a net loss of taxonomic diversity in the world. Obviously our wildlife has not remained and is not remaining static. This is the result of hunting for food, species introductions, land-use change, and other by-products of our economic activity, among other things. The net result has been extinction of many species found nowhere else in the world and the introduction of many species found elsewhere in the world. This boils down to a net loss to global taxonomic diversity. We have caused a great deal of loss of taxonomic diversity and we have reduced the abundance of many of those indigenous species that remain. Some of these changes have been incidental to human activity, some have been deliberate. There is no reason why we can’t choose to slow or reverse some of these trends and plenty of reasons why we should. We have had seven or eight hundred years of your novel ecosystems and interesting introductions. I can stand on top of Mount Herbert on Banks Peninsula and look out over the plains and there is nothing left of what there once was (within a margin of error). It has been centuries of one-way traffic. It’s well past time we pumped the brakes and if possible put it in reverse. Overarching point. Lotta chin-stroking in what you say. What are you suggesting we actually do? You talk about people enjoying the new species and ecosystems, well sure. But we all saw the marches when the government proposed mining in National Parks. And the government ultimately backed down. That says something to me. Thanks again for your thoughtful comments Joe. I really appreciate them. You note that human activities have increased the rate of extinction in recent years, and this may not be compensated by increased rates of evolution. That’s right, and the truth is we don’t really know whether one will counterbalance the other, or if a counterbalance is strictly necessary for that matter. Estimates of the total number of species we have on earth vary wildly but it is something over 8 million. In comparison, in the last 500 years we’ve caused about 785 documented species extinctions. But the actual number of extinctions is likely much higher, partly because most of the world’s species (mostly bugs) have not been classified (so we don’t even know what to carve on their tombstones). Remember as well though that most human-induced extinctions have not been caused by species introductions. They have been the result of direct exploitation, whether through overharvesting or habitat loss (that’s mostly true of NZ as well). Invasive introduced species have generally only been a factor in the extinction of certain taxa and in certain environments (e.g., islands). They have also typically been a factor only in association with others (e.g., loss of primary habitat, pollution). As I think you note, it’s not as simple as just saying that we’re going to aim to return to pre-human rates of extinction. We don’t live in a pre-human world (and don’t want to) and we’ve changed our ecosystems to the extent that there truly is no going back. And maybe the number of species on the planet is going to have to decline a little to accommodate the 7 billion people we have to care for. We can’t have it all our way. I think we need to talk more about extinction in general (whether genes, varieties, species etc) and when it might be acceptable, partly because it will happen whether we think it’s right or not. I don’t think people are genuinely concerned with ‘a net loss of global taxonomic diversity’. That’s not particularly relevant to people, especially when they can see that diversities are increasing on a local, regional and national level due to introductions. But they are concerned if they lose a species that they value. And they are concerned if the ecosystem services that they have become accustomed to decline or disappear. We need to manage for these values. When it comes to the effects of introduced species on extinctions it is also not always an easy choice. For example, how many stoats is it OK for us to kill to save the life of a kiwi? 100? 1,000? 1 million? Where do we stop? And why choose saving the kiwi over the hundreds of bugs we could save instead (and it is a choice)? Again, are we really concerned with species numbers on a balance sheet? We also need to balance out our protection for species that are no longer well adapted to survive in the modern environment (generally our rare and threatened species) with our support for those that are thriving and that will likely be the basis of future life and future evolution. These are our often unheralded and even sometimes-despised common species, both native and introduced. As you say, people’s attitudes change. We used to love cutting down forests and draining wetlands. We used to love introducing species. We also loved killing the natives that threatened those introductions. We were very passionate about. Now we take the opposite approach – and we’re equally convinced that that approach will prove enduring. Personally, I’m not convinced that the way we understand our wildlife today will be considered particularly credible to people 100 years from now. I say this partly because our current attitudes are just too dogmatic. We have really just reversed our understandings from 150 years ago. The concept of novel ecosystems, for its part, is just that – a concept. It is about opening up conversations around how we choose to value our ecosystems and challenging us to think about the ways they might need to change. Yes we need introduced species to remain, yes we need to protect and improve our natural ecosystems and maintain the biota that remains. I believe these are not mutually exclusive objectives and I agree the polarised views from vitriolic opposites are unhelpful. Ecosystems are dynamic and favour particular species at various times but over long periods of time lead to a relatively stable population of all species that fit their ecological niche or are adaptable enough to weather times of change. New Zealand’s varied and diverse ecosystems are not easy to understand and early attempts to “pigeon hole” what was needed to preserve at risk species and ecosystems have been proved deficient and even now we have huge holes in our understanding of what is going on out there. What we do know though is how to manage our game animals and how to keep so called pest species at reduced densities. Even the latter though is subject to huge variations in effectiveness and necessity with some forest types seeing markedly improved survival of the at risk species when control is conducted and in other forest sites little to no benefit or indeed detriment to the species present. So your statements about the naivety of using terms like the Deer are like Moa are correct. However, often in debate over complex problems those engaged in the debate attempt to simplify the terms so the so called “layman” can understand and make a judgement. If we take the Deer are like Moa term as an oversimplification of a complex series of interacting circumstances, responses and species then the term still has some use, with some caveats….. Moa had already disappeared before European’s settled here and we have no idea what forests or grassland looked like when their numbers were high. Coupled with that we do not know for sure what killed the Moa off. Maori brought fowls, Kiore and dogs with them when they arrived. They would have also brought exotic diseases that may have paid a large part in causing bird species to go extinct. Even today we are looking at disease as a leading cause of native bird death in this country. Land use has been the largest contributor to loss of species in New Zealand. Intensification of land use will continue to impact native species survival in the future and the waste, erosion and contamination caused by human activity will also negatively impact native species for decades to come. 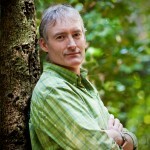 It is well accepted today that the alarmist works of Cockayne that gave birth to the fervour that still drives the Eco-fundamental groups policy towards introduced species and their effect on native flora are flawed in their observation and logic. However, it is clear that uncontrolled populations of grazing mammals are detrimental to the ongoing health well being and indeed very existence of some endemic species. Even then though the capacity for regrowth, re-establishment and grazing tolerance of most endemic species leads most capable of reasoned thought to understand that impacts can often be largely reversed or indeed tolerated for extended periods with no ultimate change in species presence. The profile of flora present and canopy mix might be altered but that occurs naturally anyway with forest turnover and has been demonstrated in Fiordland the processes by which certain plants are able to establish themselves when older canopy members fall protects them from the species that would do them harm until they are well established. All of this indicates a very elastic and perpetual series of systems exists within our ecosystems to ensure survival of species even when faced with pressure from grazing mammals that may or may not approximate what occurred when the Moa walked this land. We have enough science to manage our introduced animals to ensure the survival of even our most endangered species. We do not have a bottomless pit of money to achieve the outlandish, undesirable and simply unobtainable Predator Free New Zealand and why we would wish to even attempt that needs to be debated. It was an idea put out there by Sir Paul Callaghan that even he did not think was achievable. It was a nice to have but the idea of Halo’s has merit as does captive breeding programs to ensure survival of large numbers of Mohua, Kakariki and other critically endangered species that can be placed where they will flourish. Who knows there may even be Deer and Pigs sheltering and feeding in those forests, increasing the speed of turnover of plant material, increasing invertebrate population and spreading seeds of preferred browse about the forest floor while providing sport recreation and food for the human population protecting and enjoying their environment. There is no black and white to seek, everything in ecology is complex, interlinked and incomplete. Shades of grey are all we have currently but work proceeds and indicates that the more we learn the more variables we need to consider and the simple solution to a complex problem is clear, concise and ultimately wrong! Great, I love these comments Craig. I agree with a lot of your points, so much so that I don’t have much to add. There is actually going to be a formal debate on Predator Free 2050 at the Crazy and Ambitious conference at Te Papa on May 9. I’ll be participating in that discussion alongside and maybe sometimes in opposition to (who knows) fellow Sciblogger Wayne Linklater. I am glad it rings true to you Jamie. I am glad some of the younger thinkers in our midst are brave enough to challenge the notions that seem so engrained many of us look on with despair. I wonder sometimes if the complexity of the issue drives people to attempt to shortcut what is required to truly get a grasp of what is going on and that is how we get such skewed views of where we are at. Enjoy the debate, I sincerely hope people will realise the Predator Free thing is a pipe dream that will consume funds that should be put in to other research that would fill some of the gaps in our knowledge because I truly believe we do not understand nature very well at all and are not researching many things we should. I suggest that peoople apply a similar logic as that above, viz that Forests are Dynamic, to Possums, Boar, Goats, Rodents and Mustelids; Everyone has a place in a Dynamic Environment. No one suggests eradicating Hunmas who are the worst pests; it is hypocrisy to suggest eradicating any other speices. If you read Wade Doaks writings you will understand why it is important and worthwhile to remove pests in New Zealand.